The 2017 Masters was not Sergio Garcia’s first time to win a major championship. Somewhere along the line, the British Amateur and U.S. Amateur championships were shuffled off the top shelf of golf accomplishments in favor of only professional majors. Without the two amateur competitions, Bobby Jones’ fabled number of 13 major titles would only be seven. Perhaps the blame goes to Jack Nicklaus who was not adamant enough in including his two U.S. Amateur wins in his Majors total, which would make the number 20 and not 18. Tiger Woods would have 17 major titles (three U.S. Amateurs) and not 14. Sergio Garcia Fernandez was born in Castellon, Spain, the son of a club professional. He started playing at the age of three and began racking up a parade of “youngest” benchmarks. 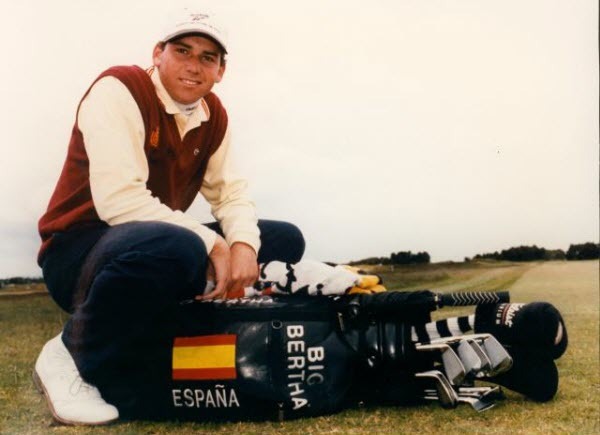 Garcia was the youngest player to win his club championship (12), the youngest player to make the cut in a European Tour event (15) and the youngest winner of the European Amateur (15). He won his British Amateur at storied Muirfield Golf Links by beating Craig Williams in the final, 7 and 6, to become only the second Spaniard after Jose Maria Olazabal to do so. The following year, Garcia made his first headlines at Augusta National by winning the coveted Silver Cup as low amateur in the Masters. He turned professional and won his sixth event, the Irish Open. That summer Garcia, now a TaylorMade Golf spokesman, implanted himself in golfing lore in the PGA Championship at Medinah Country Club by closing his eyes and whacking an open-faced 6-iron off a tree trunk onto the 16th green, following the shot with a racing, leaping run up the fairway. He finished second in the championship by one stroke to Woods. Not yet 20 years old, Garcia was cast as the player who would be able to rival Tiger for years to come. Garcia indeed won his first PGA title at the age of 21 to become the youngest Tour winner since Woods. There would be other wins, usually on tough golf courses, but Garcia’s star dimmed in comparison to Tiger Woods, as did all of golf. Always an emotional player, Garcia carved out his biggest reputation in the Ryder Cup where he has been one of the most successful competitors of all time. He has played on five winning teams in eight appearances and compiled a formidable 19-11-7 record in his matches. Garcia’s biggest win on Tour came in the 2008 Players Championship, the same year he rose to World Number 2. After that, however, El Niño blew into a prolonged slump that, in a rare admission for a professional athlete, he attributed in part to a break-up with his girlfriend, Morgan-Leigh Norman, the daughter of golfing great Greg Norman. He even announced a break from competitive golf. When Garcia returned, it was with a new claw putting grip. Using a natural swing unsullied by instructional tinkering, he has always been one of golf’s purest strikers of the ball, but often the Garcia game is undone by poor putting. A Garcia win – and there have been 23 on the PGA and European Tours – seldom looks easy because of the greens work. He has been in a remarkable 20 playoffs, with a 10-10 record. By contrast, Woods has been in only 12 PGA playoffs, with an 11-1 record, and Phil Mickelson, ten years older, has been in only 11 playoffs (7-4). Golf fans saw a different Sergio Garcia at the 2017 Masters. He was less bothered by the rub of the green when things did not go his way on the course. He will be married soon and has clearly entered a more settled period of his life, despite protests that he is still the “same goofy guy I always was.” Mickelson did not win his first major championship until he was 34 years old and added four more after that. Golf’s young guns that have come along in the past few years will no doubt dominate major championship leaderboards in the near future but do not be surprised if there are a few more Garcia titles tossed in there as well.